So since the death of Human Torch, the Fantastic 4 (Now known as "Future Foundations", or to some fans: "Fantastic Family"), should have gotten a lot worse. And you know... I can't help but think it didn't change at all. It feels like this book hasn't missed a single beat, and I'm really impressed. Jonathan Hickman is easily one of the best comic-book writers there is, right now. I say this without even a second thought or hesitation. This guy is a Magic-Man. He has pulled a title that was so deeply entrenched into fanboy, sci-fi, backstory history, and transformed it into a beautiful work/display of human emotions, family values, awesome action, and intense dialogue filled with intelligent discussion. The book is only as smart, an therefore can only be as good, as the writer. If the writer doesn't know anything of science, the book bombs. The stories are killer, honestly. The death of Johnny was absolutely heart-wrenching and then the overview of that, the next issue... not a single word is uttered until the end when Spider-Man, -no. When Peter Parker talks with little Franklin about losing an uncle. It is the most powerful thing I've read in a comic book. Ever. To date. I don't care if you are furious with Johnny's death or think Spider-man's a bad "replacement" (if you can even call him that, within this series). The truth of that scene is, two boys miss their Uncle. Brooks' artwork on facial expressions for Franklin is just, ... sad. It's so well done. The art is still Fantastic! 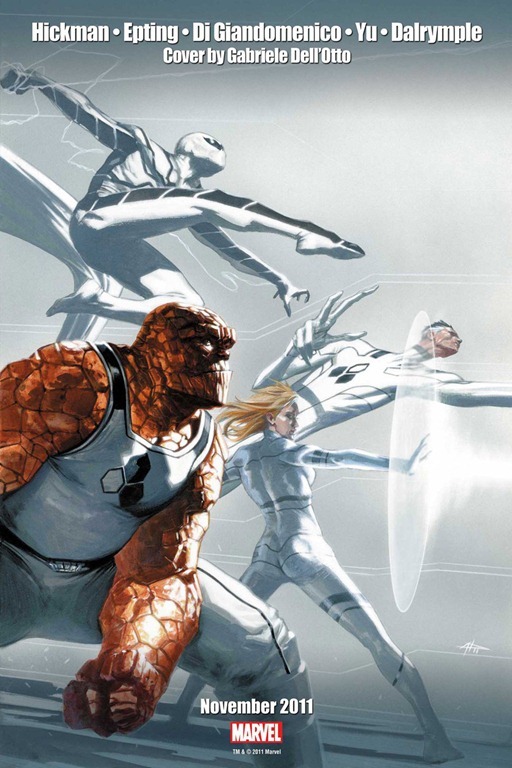 The Fantastic Four will be returning! Awesome, simple, clean, cover, AmIright?